New Dim-to-Off Setting in ConnectLED – All Versions! ConectLED Windows v2.0 and ConnectLED iOS v1.1, both released in February 2018, permit owners of Evluma AreaMax and OmniMax LED lighting products to Dim-to-Off. ConnectLED Android v2.3, live in the Play store March 5th , also boasts this customer-requested feature. Dim-to-Off programing enables utilities to shut off lights altogether at a designated time or for a short time period. From energy savings to light pollution reduction, holiday lighting, fireworks or movies in the park the reasons to dim street and area lights to off are numerous and unique to every municipality. Site license owners with an Enterprise User profile can Dim-to-Off using the familiar ConnectLED dimming schedule controls. 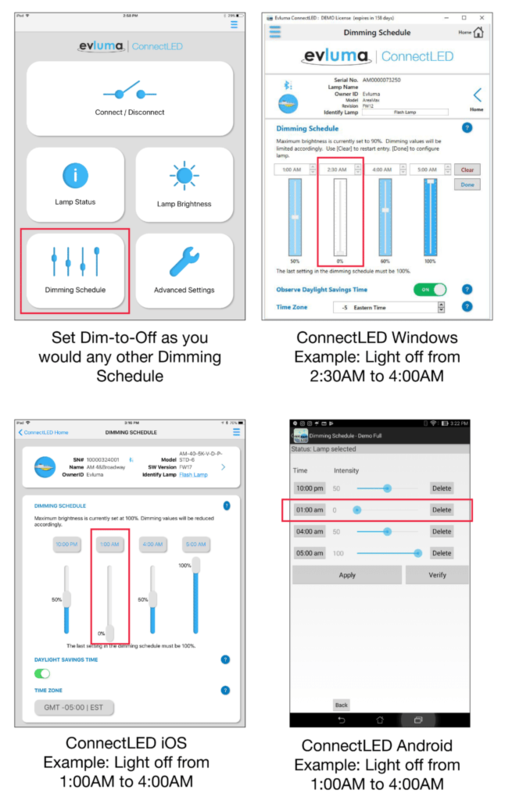 Access dimming controls via the Dimming Schedule tile on iOS and Windows versions. Access dimming controls via the Configuration screen in ConnectLED Android. Previously, dimming was restricted to a 20% minimum. Now dimming can be set to 0% or ‘off.’See the examples below for what a Dim-to-Off setting might look like in each version of ConnectLED. Tip: To have lights turn off for a remaining period of the night, schedule the last setting (return to 100% required) for a time after sunrise. Photocontrol Failsafe and/or photocontrol operation will confirm that it is daytime and the light will stay off.